(Newser) – Perhaps you know someone who's written his name in snow, you know, with urine. That's essentially what some fish do every day. In a study titled, "To pee or not to pee: urine signals mediate aggressive interactions in the cooperatively breeding cichlid," researchers explain that urination for the cichlid fish is not only a bodily function but also a form of communication, per Science. To figure that out, they injected the fish with a dye that turned urine blue, then measured a fish's urine while it was kept separate from other fish. 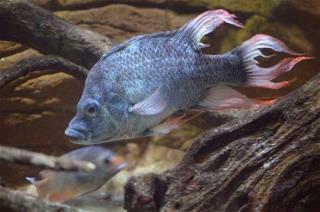 Researchers then placed a larger cichlid and a smaller cichlid in the same tank, separated by a transparent barrier. When the fish spotted each other, they swam toward the barrier in an aggressive manner with fins raised and peed. I knew they communicate, all animals communicate. His name? I know someone who written her name in a snow. gee it's a shame we can't pee on politicians!